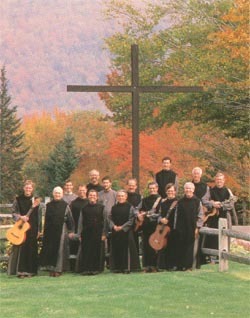 Some of the best-loved Weston Priory music includes Wherever You Go and Hosea and All I Ask of You from the Listen CD. Other music from the early days of Weston Priory include Locusts And Wild Honey, Go Up To The Mountain and Spirit Alive. In more recent times the monks of Weston Priory have continued to create contemporary music including the Morning And Evening Prayer collection, Hear the Song of Your People. Weston Priory's latest CD is unique in giving each song more space and time for prayerful listening and reflection. Let us set out on a pilgrimage of the heart to a world transformed by the love of God! Includes: The Dove's Song, Yahweh, Anything Happens, A Light Has Shone, and Wherever You Go. Includes: All I Ask of You, Mary's Song (Mary Magdalene's Song), Hosea, Hands, and Listen. Includes: Journeys Ended Journeys Begun, A Time to Gather, Bread That Was Sown, The Sun Is Rising, and Spirit of God. Includes: Something Which Is Known, With Thanksgiving To God, Hear Our Prayer O God, and Go Up To The Mountain. Includes: Morning Softly Awakens, God Will Be With Me, Something Which Is Known, and Deep into the Stillness. Includes: Life is a Journey, Hear O Heavens, Listen With the Ear of Your Heart, and Move With One Heart. Includes: So Strong Your Love, With Broken Bread in Our Hands, Break Open the Bread of Your Life, and Song in Our Silence. Includes: Sing to God a New Song, Fire of Our Fire, We Wait For You God, and Parting the Waters. Includes: Burn Bright As Our Light, Stronger Than Death is Your Love, Let There Be a Feast and When We Return to the Source. Includes: House of Jacob and of Rachel, Who Shall Dwell in Your Tent?, God Ever New, Walk Along The Pathways, and Formed From This Earth. Includes: Maria Of All Our Americas, Bread On Every Table, No One Goes Hungry, and With An Everlasting Love. Includes: Come To Me, Come Now My Love, We Thank You Father, and Peace.